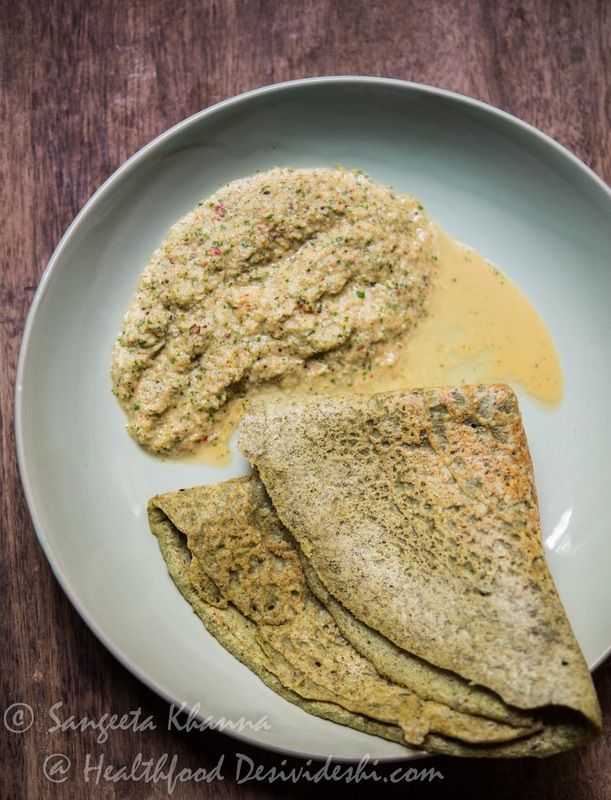 Green mung bean dosa or Pesarettu is a green dosa or thin savoury crepe that tastes heavenly with coconut chutney. Pesarettu belongs to Andhra Pradesh and this one dish is a perfect indication of how rich the Andhra cuisine is. Pesarettu is very simple dosa that is served with some chopped onions smeared under the folds and a dollop of vegetable based chutney mostly. The batter of pesarettu doesn't need any fermentation and can be prepared at home without much effort. Pesarettu can be made crisp when you want to serve it hot off the griddle or it can be made soft wheen it needs to be served warm or at room temperature after a while. It becomes a good lunch box food when made soft and fluffy. 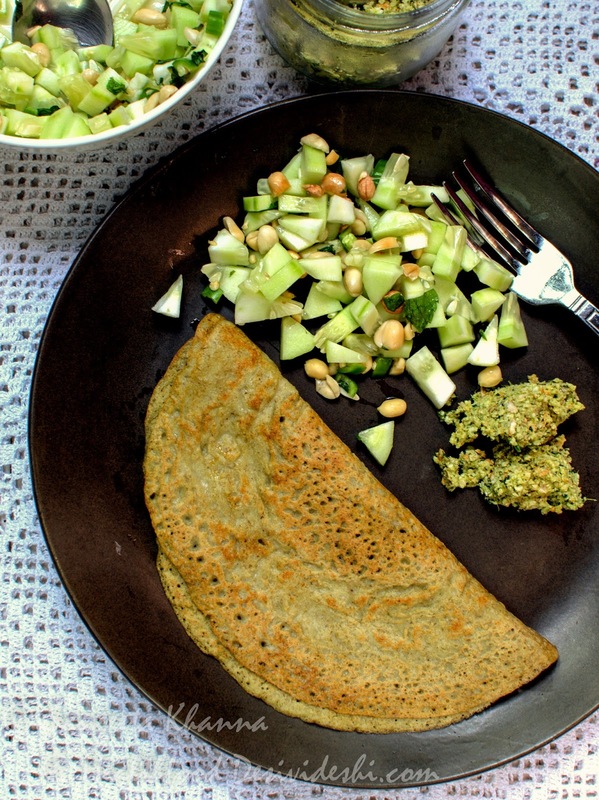 So it is a green dosa made with green mung beans and nothing else. Overnight soaked green mung (with skin) is blended with water and some cumin seeds and salt and is immediately cooked to make the crepe called Pesarettu. The simple recipe which I had noted down from a newspaper column written by Jiggs Kalra, almost 11 years back when I had just started cooking in my own kitchen right after my marriage. I love this recipe for its simplicity and delicious taste with mild presence of cumin. The proportions have changed a little bit as I have been making it since very long and may be I am adding a little too much cumin seeds in it (than was specified in the original recipe) but a good recipe is the one which is personalized or customized to your own palate. I am sure you agree. The best part of a pesarettu breakfast is that you can serve it the way you want. Since I like some vegetables included in my breakfast mostly, I serve it with a kachumber type salad often. Here the pesarettu has some coconut curry leaves chutney and a generous dose of tomato, onion, cucumber kachumber salad. Sometimes just some cucumbers, green chillies, mint and sprouted peanuts work. In the picture below I served it with a green almond and rucola pesto that we can eat with just about anything. Once you start making pesarettu as a base you can keep on experimenting with what kind of accompaniments you like with it. I even like it with a Gujrati pickle called Methiya athanu and fresh yogurt. You need to soak the green mung beans overnight or at least for 4 hrs and then grind it with green chilies and cumin seeds. Salt is added and the batter is ready. The dosa will be made on a cast iron dosa tawa or an iron skillet just like crepes. Pour a ladle full of batter on a greased hot tawa and spread it with the help of the back of the ladle. I like them a bit thicker than a paper dosa and slightly browned to get a crisp texture. If you want a softer dosa do not brown it especially when you want to carry this in your lunch box. The crisp dosa gets chewy when cold but is delicious when served hot right from the tawa. We like it this way.. Serve hot with a chutney of your choice. Or make many chutneys if you feel fancy. The chutney in the above picture is a quick coconut chutney that I often make with dry coconut flakes if there is no fresh coconut in my freezer of vegetable basket. To make the chutney make a tadka of pinch of heeng, 1/2 tsp mustard seeds, 1 tbsp urad dal, 3 red dry chillies, 4 cloves of garlic and 10 springs of curry patta added in that order to hot sesame oil or ghee. Cook everything till it becomes aromatic and them cool down. Add this to a cup of grated fresh coconut (or 1/2 cup dry flakes) and one small raw onion sliced, add salt to taste and make a fine paste. Add lime juice to taste. Some time ago my Hyderabadi neighbor brought some Pesarettu (with a smear of fried onions, green chilies and ginger on one side) one morning, it was good but as we have liked this recipe for years now, I am not going to change it for anything. Liberal dose of cumin is the reason. I sometimes add some ginger and dhaniya patta to the batter too for a little different taste . We had been eating mung ka cheela in our childhood which is a similar dosa made with skinned yellow mung dal and is filled with a paneer stuffing. 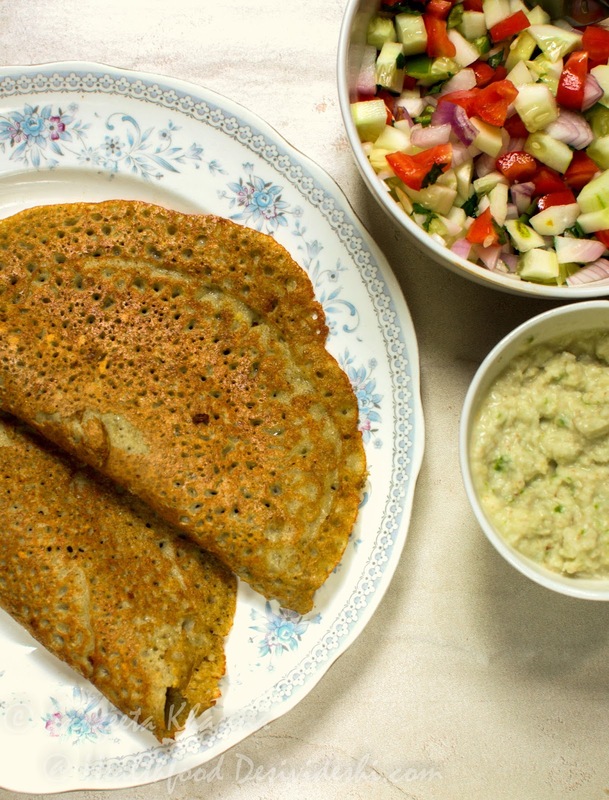 Another mung ka cheela stuffed with vegetables and sprouts is a great option when you want to have gluten free breakfasts. Pesarettu also can be stuffed with mashed paneer or tofu or just some nice chutney. Green mung beans are not so rich in protein as many think, but it is a great source of lean protein and complex carbohydrates making it an excellent low glycemic food that keeps one full for a long time. Green mung is also a good source of Iron, Magnesium, Phosphorus and Manganese and a few Vitamins like Folate. 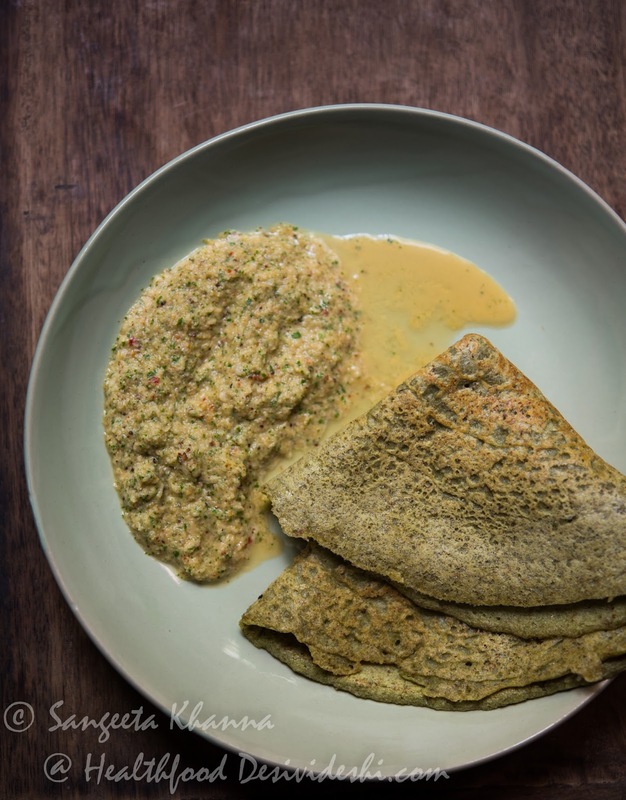 Sangeeta, I love your moong dosa recipe. I love the liberal dose of cumin and I think I will also increase the amount of cumin I add in my dosas. Stuffed brinjals: Lovely preparation...I liked ur step by step instructions, addition of methi sounds too good. Just saw your comment on my blog. Thanks for the comment. You have a very cute blog. My mother use to make this dosa. I love this.